Radio Free Europe / Radio Liberty broadcasts in 28 languages. Most of our programs are available on FM and medium-wave frequencies of local radio stations in the countries of our broadcast area. If you are having problems listening to programs on the internet, please read our technical help document. A man holds a portrait of opposition figure Aleksei Navalny. The opposition said “tens of thousands” had turned out in Moscow for the rally, while Moscow police put the figure at some 8,000. 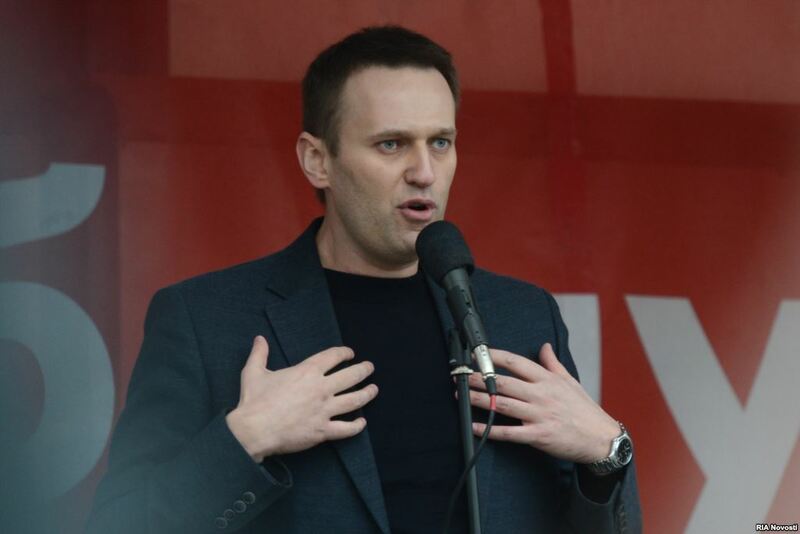 Aleksei Navalny called on the opposition to show courage and unity. Badges with the slogan "The Case Against Navalny Is The Case Against Me" are seen before being distributed. "We are not to be intimidated," said Russian opposition figure Boris Nemtsov. A gay-rights activist (center) scuffles with Orthodox Christian activists. Police detain an Orthodox Christian activist after a scuffle with gay-rights activists. Police trucks are parked on Bolotnaya Square ahead of the protest. Emergency workers examine the body of 25-year-old Maksim Melkov, who died when a loudspeaker fell on him during construction of a stage for the rally. One year after the protests on Bolotnaya Square on the eve of Vladimir Putin's inauguration as president, the Kremlin has managed to change the conversation. Have they changed the game, too? MOSCOW -- An opposition rally on Moscow’s Bolotnaya Square, called to mark the first anniversary of an antigovernment protest that ended in riots and hundreds of arrests, has ended peacefully. Thousands gathered on May 6 to hear leading opposition figures deliver speeches, many aimed at reminding the crowd about the fate of the more than two dozen activists who are still in detention following last year’s rally, which protested Vladimir Putin's return to the presidency. A placard on the main stage at the event read “Freedom for the Prisoners of May 6,” a phrase the crowd also chanted along with “Russia will be free” and "Putin's a thief!" The rally was opened by opposition figure and former Deputy Prime Minister Boris Nemtsov, who called for the release of the protesters. "Bolotnaya prisoners -- there are 27 of them. This case is fabricated. Today, we must remember each and every one of them," Nemtsov said. "Today, we must fight for freedom for political prisoners, and the Bolotnaya prisoners, and all other political prisoners to end this police despotism, to put an end to political persecution. We are not to be intimidated!" One of the participants, Natalia Kolnakova, recalled the scene at last year's protest on Bolotnaya. "We were here exactly one year ago and we saw all this horror. We saw how hooded thugs were let into the crowd through the chain of the riot police forces surrounding us," she said. "Those thugs were trickling into the crowd in front of our very eyes. We were stunned to see it happening." Opposition activist and former Prime Minister Mikhail Kasyanov blamed authorities for creating the situation that led to last year’s clashes between protesters and police. "Our truth is this: The last election to the State Duma was illegitimate, and this Duma is illegitimate, and the current president is illegitimate as well," he said. "This is exactly the reason behind the provocation that the government arranged [during last year's Bolotnaya rally]. Today, we say it loud and clear: This was a preplanned provocation." Anticorruption blogger Aleksei Navalny, who has emerged as an opposition leader, called on the opposition to show courage and unity. "One year ago when I was here at the rally, there were zero criminal cases against me," Navalny said. "At a rally on September 15, there was one criminal case against me. At a rally on December 15, there were four criminal cases against me. Now there are either four or six criminal cases against me. I lost count myself. And I don't give a damn! There may be 124 criminal cases and I will go on saying what I want and I will speak my mind. And I think that you do not want to hear anything from me but truth." Navalny has been on trial in the central Russian city of Kirov on charges he helped steal about $510,000 worth of timber, charges he says are politically motivated and stem from his attempts to cast light on government misdeeds. Earlier on May 6, a rally organizer was killed in an accident. Moscow police said 25-year-old Maksim Melkov died when a massive loudspeaker fell on him during preparations for the rally. 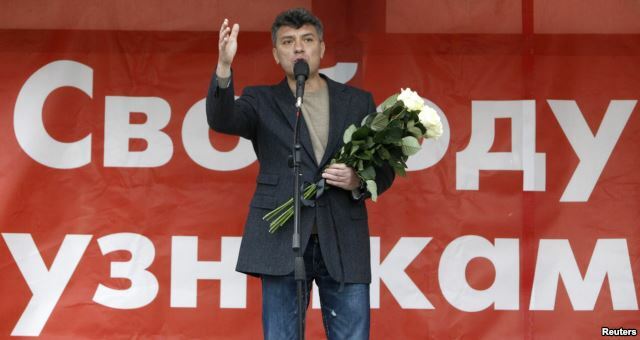 Nemtsov opened the rally by calling for the crowd to observe a minute of silence for Melkov. Russia's Investigative Committee had said no activities could be held at the site until a probe into the incident was completed. But Moscow mayoral officials allowed the rally to go ahead as planned. Moscow City Hall granted the opposition's Coordinating Council permission to hold a demonstration with up to 30,000 people on the square. Authorities have said the rally must end at 9:30 p.m. There were reports of some minor scuffles at the rally but generally the event was held in an orderly and peaceful manner. Similar rallies were held in St. Petersburg and Tomsk. Radio Free Europe/Radio Liberty © 2014 RFE/RL, Inc. All Rights Reserved.